Before I start, I thought it best to reiterate the main principle for my collection of figures, and admit to two personal quirks that I have accepted despite the added difficulties they raise. The principle is simple: every portion of my wargaming collection should provide a different wargaming experience rather than being "the same thing with different hats". The main quirk is that while having different styles of rules for each period, I am strongly drawn to using variations of the same basic rules, partly because they are easier to remember when I start flitting from period to period, and partly because if properly done, it can reflect the differences and similarities between periods while reminding one of the evolutionary nature of warfare. The other quirk has no rationale. Since high school days if not earlier, I hate being trendy or worse, appearing to be so! Somewhere far from the main armies, General Smith's blue regiments, advancing on a 3 road frontage towards the Stone Bridge at Littelton, bump into General Kinch's grey columns moving down 2 roads. 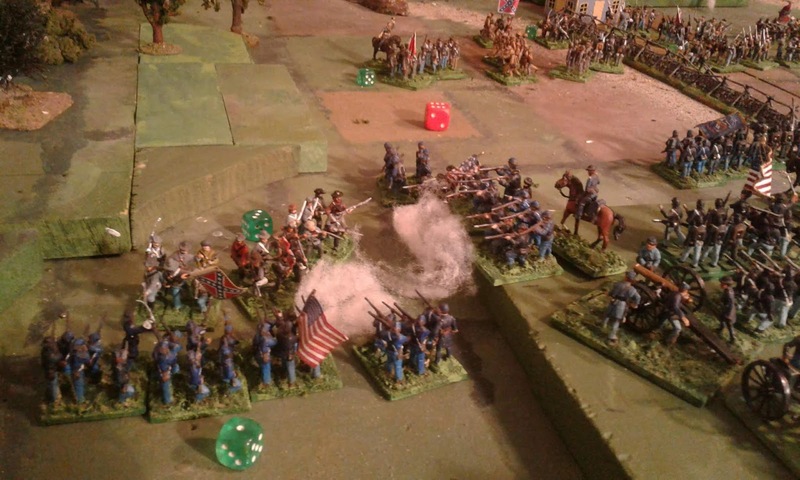 So, I decided that it was time to put the 54's away for a few days to give someone else some exercise and the choice fell on the ACW lads. 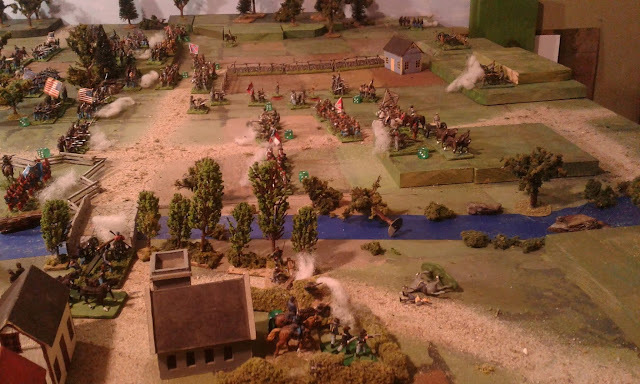 The last ACW game (click) I had played was yet another attempt to go from regiments to brigades as basic units. I've played my share of the original Fire & Fury as well as Volley & Bayonet, and have a copy of On To Richmond but, well, writing my own has been part of wargaming since the beginning. 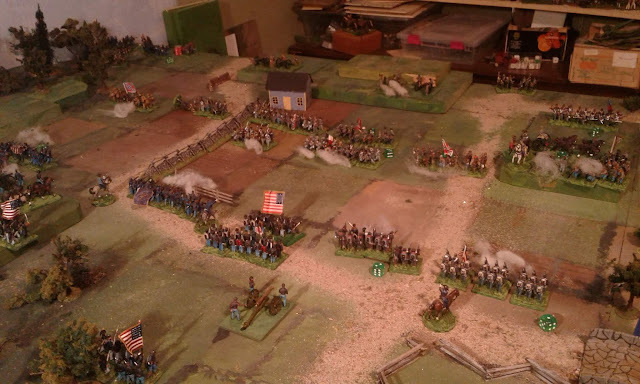 The game laid out with 8 stand brigades using variable length moves and ignoring the grid. The rules I wrote up in July were non-gridded with Brigade sized units so I set the game up ignoring the grid consciously but subconsciously making the terrain conform. The game started well but after about the 10th time I had to circumnavigate the table to search for the tape measure I had put down...somewhere......, I decided that the grid wasn't so bad and could be used to measure distances in 6" increments, measuring by the stand and not worrying about forcing units to conform to the grid. That actually worked quite well for a couple of turns but did it really feel like these units were brigades and I was a division or corps commander? Do I really know enough to know if the feel was right? What I did know was that some of the colour and period, not to mention "toy soldier feel" is lost when a famous regiment becomes just one or two of the stands in a unit. So I took a few more minutes to reorder the brigades into regiments then grouping them into 3 regiment brigades for the Federal army and 4 regiment brigades for the Confederates, borrowed the movement rules came from the Square Brigadier and the combat system from Hearts of Tin. I added a simple morale check as a nod to Don Featherstone's early influence and was ready to go. OK, at last, on to the battle! The Union army was cursed with a wood, a hill and a farm right in their path in a way that made it hard to deploy but they were blessed with a wood and a hill for their advance guard to hold while General Smith decided where to commit the rear brigade. General Kinch's force came on in a fairly concentrated formation in open ground with hills at the back for his artillery. 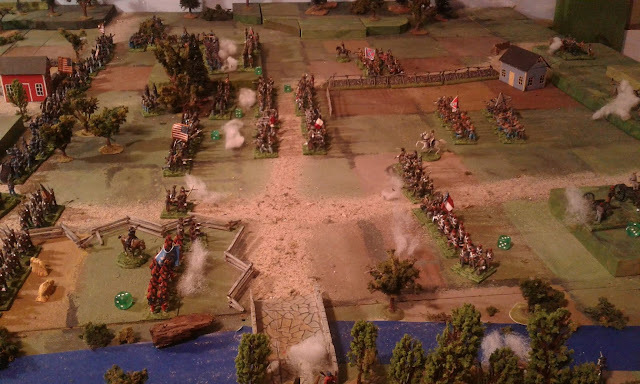 He lost no time in throwing his brigades forward in a massed attack hoping to crunch the Union line before their whole army could deploy. 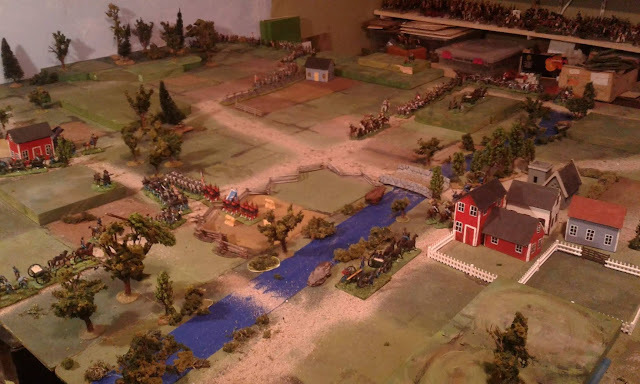 As the troops advanced, the word came down to reorganize the Division from 8 stand brigade units into 4 stand regiments which was swiftly done without confusion and the battle went on. The Rebel attack hit the Union line hard but the close range fire of the Union guns and the good defensive terrain helped the Blue line to hold. A lengthy close range firefight ensued but as reinforcements arrived to plug gaps and extend the line, threatening the Rebel flanks, the attack faltered and suddenly the Grey line gave way. It took a little time for Smith to get his division reformed and ready for a counter attack but eventually the Blue lines moved forward. The game from there moved quickly and eventually reached a clear but never inevitable conclusion in what seemed like half an hour but which appears to have actually been more than three hours by the clock. I fielded about 600 figures without crowding the table so there is room for some of the unused units as well as some additions. 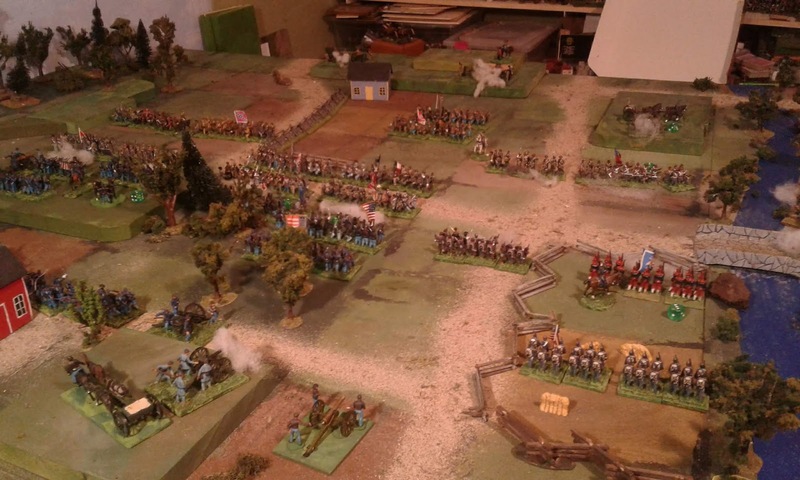 Using a "regiment as unit" set of rules, I'll never be able to fit any of the larger historical battles on my table without extreme bathtubbing but that wasn't one of my serious ambitions anyway. This setup finally ticks all my boxes so the plan for the fall/winter is to turn the loose collection of stands into permanent, 4 stand, identifiable, named and marked regiments, each with their own good flag, as planned in 2010. Then I have to make sure I have enough brigadiers and that they all have names to help with developing narratives and possibly a campaign at some future time. Once that is done I can turn my attention to organizing the mess of painted cavalry and then, finally, paint up some more of the figures who have been idling in the cupboard for much of the last decade. Oh, and I have to turn my quickly scribbled notes into a proper, comprehensive set of rules along the way. The pictures are rather dark than fuzzy, yet that gives an excellent 'period' feel. I have long felt that the ACW was rather a 'dark' war. Don't ask me what I mean by that - it just seems to me an appropriate adjective. On the matter of 'knowing enough', I sometimes think it would be more fun if I knew less about a given period. There are a number of reasons for this. One is that knowing a little, just enough, can give a war a certain romantic aura that tends to fade as one's knowledge increases. One can feel a little constrained by history, too. Against that, of course, is the feeling of not knowing quite enough, and the exploratory enjoyment of reading new books and articles with their own slant on the war, or that introduce matter that one has not before seen. hmm, Well, they look a bit blurry on my end. I agree that two much knowing often spoils a period. One of the things I like about the ACW is that there are so many memoirs available from privates to regimental officers to Generals and even at least one doctor as well as official reports as well as modern histories and studies though I much prefer first hand accounts. Luckily after decades, the interest doesn't fade, maybe due to the positive spin on so many memoirs? What I should have said is that if the player is a Corps or Army commander, he really shouldn't be involved as a player when carrying out the attacks made as a result of his orders. As a confirmed believer in grids, it is obvious that I am going to applaude your decision to change over to using them in your latest battle. As to the battle report ... well it was one of your best, and I loved the sheer scale of it. My first ACW figures were all Airfix and I think that they are still my favourite figures for that period. They were big enough to have a bit of character and small enough not to take up too much space on the tabletop. I only wish that they were available in metal. I do like the figures, they have a certain 'toy soldier' aspect, especially when massed in units all in the same pose. The newer model style figures are very well done but without the same charm though I like and use them as well. I'm glad they are plastic though. 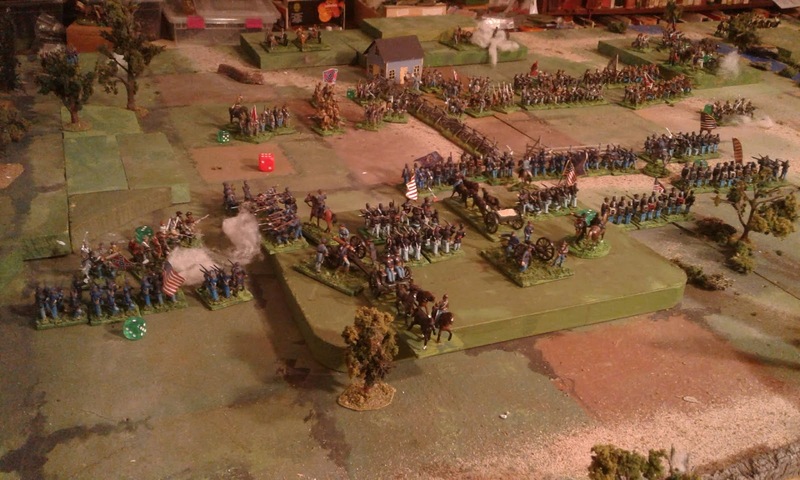 The whole of the Union infantry weighs less than one unit of 40mm metal figures. Ross, enjoyed. Good move to regiments and 4 stands seems a fair representation, so that line does get a linear look. I fairly happy with the look. The lines 2 deep and shoulder to shoulder are more like those in prints than the real thing but that's fine with me. One of my goals is to occasionally deploy as many of my figures as I can. Ross, I agree. In my opinion, wargames are an artistic interpretation of the history, so it is perfectly valid - if one so wishes - to recreate battles as they were portrayed by contemporary artists and hence as they were perceived and imagined by the civilians of the era. Great to see the OO/HO Airfix figures Ross - great photos of the battle too. It is great to push them around the table! 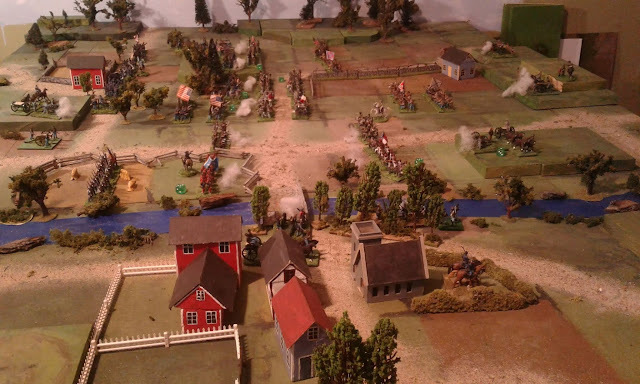 It’s the kind of ACW game we wished we could do when I was a kid... we never had that many figures... none of them were painted... and I think some of them were cowboys. Thanks Aly. I had one box of each of the ACW sets + cavalry and cowboys when I was a kid. That's been fixed now!